The West Side Late Shift: Ammunition as Art? Those of us who reload for precision know there is craft and workmanship involved in creating the 'perfect load', both in composition (amount of powder, type of powder, weight of bullet, brass and primer quality) and in form (OAL, primer seating, consistency). 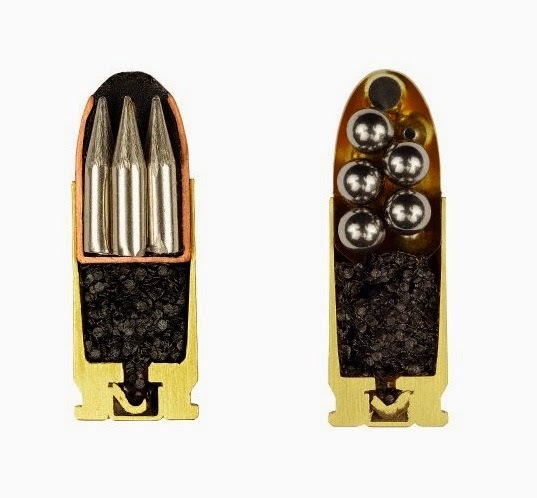 The Smithsonian has a great article concerning the photographer Sabine Pearlman and her project to portray the beauty of ammunition. She photographed a collection of existing cross-sectioned ammunition. While originally (still?) an Australian anti-gun rights advocate, she saw something compelling in the juxtaposition of composite beauty and purpose. The article contains many of her photos, similar to the one shown here. Pretty interesting.